We’ve tried to make finding your way around the Offshore Radio Museum as easy as possible. 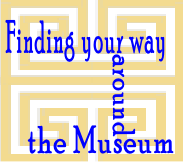 The best way to explore is to wander around the galleries as you would in a physical museum. Alternatively, use the conventional navigation bar at the top to find the floor/gallery you wish to visit or, if you are in a hurry, there’s a Search Box at the top of the Home page. Whichever way you choose to explore the Museum we hope you enjoy your visit and return regularly to see what’s new!